In this astounding new archaeological survey, authors Robert York and Gigi York examine the history of Oceania and the Americas to unveil the significant role slings and slingstones played in developing societies. They present new evidence that suggests that unlike David who plucked rounded pebbles from a stream, inhabitants of the Pacific Islands deliberately fashioned sling missiles out of coral, stone, and clay into uniquely deadly shapes. They also show that the use of slings in the Americas was more pervasive and inclined to variability than previously recognized. Arrow Talk makes a significant contribution to the understanding of Melanesian culture and contemporary sociopolitical issues in Papua New Guinea. In a post modern era in which culture has been dismissed by many anthropologists as a reification, this book makes a cogent argument for cultural holism by showing how symbolic, psychological, religious and linguistic factors have combined to shape Melpa responses to the political and economic crises they have had to face in the waning years of the millennium. This analysis also contributes notably to the development of anthropological perspectives on colonial and post colonial historical processes. 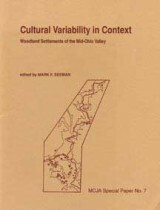 Cultural Variability in Context, a collection of papers presented at the 54th Annual Meeting of the Society for American Archaeology in April 1989, documents and explains the varied settlement and subsistence practices found in the prehistoric mid-Ohio Valley during the Woodland Period, ca. 1000 B.C.-A.D. 1000. The prehistoric societies of the mid-Ohio Valley played an important part in the development of the social complexity that characterized the Woodland period in eastern North America. Ohio Valley Adena and Ohio Hopewell ceremonialism occupy prominent positions in current interpretations of the period, as they have for many years. This volume focuses on underlying settlement and subsistence relationships, and is especially concerned with assessing time/space variability within the period and its ultimate influence on broader, inter-regional issues.